wow wow wow. Tons of driving but honestly, I had so much fun! We decided to make this run to our favorite place in So Cal. 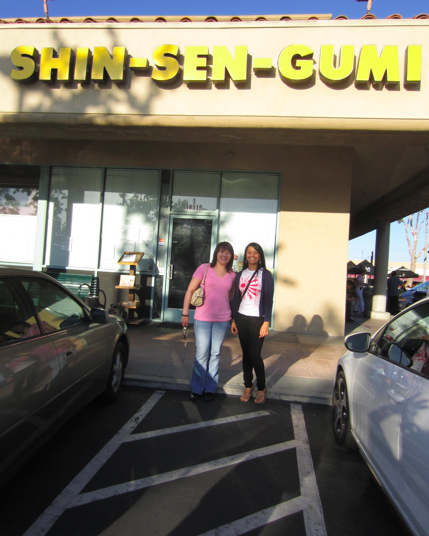 Shin Sen Gumi in Fountain Valley. Now! We don’t make this trip as often as we would like because it is a long drive. I think the drive seems longer because we always hit traffic eventually somewhere. We have to go on about 5 different freeways to get there and there are a few different ways to get there. So we really have contemplate which way would have the least amount of traffic. That’s California for you…. On this trip we brought along Joan’s cousin Michelle and my cousin Jennifer. This is their first time coming with us and we really wanted them to try our favorite place. 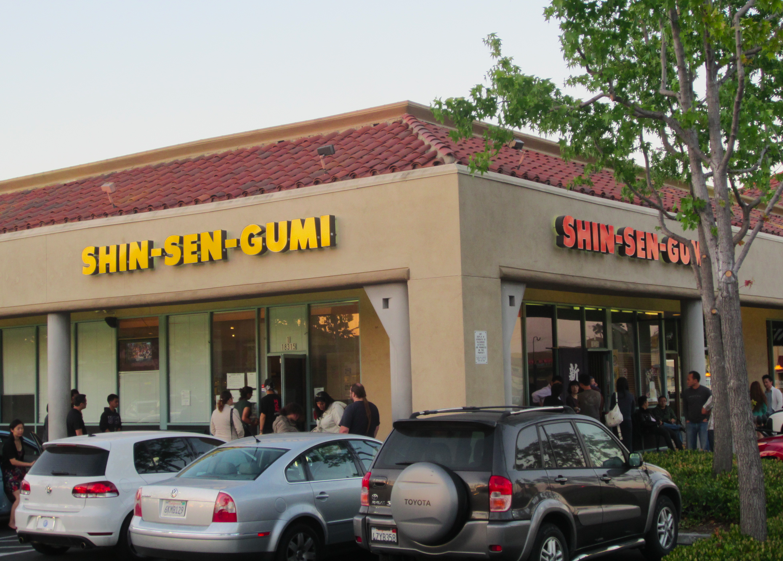 Shin Sen Gumi in Fountain Valley is actually split into two sections. One section is the restaurant part(no ramen served there) and the ramen section. I do wish the ramen side was larger. The ramen side ends up opening at 6pm so when we arrived there at 6:15pm the first wave of people were all seated and we waited……and waited……and waited. I think we waited for about 45 mins. What is neat about this place is that they bring out the menu and take your order if you are going to wait a while so they can serve you asap. Good for us, good for them. What’s also neat is that you are able to check off how you want the broth and noodles. You can choose the oil to be light, medium, or thick. 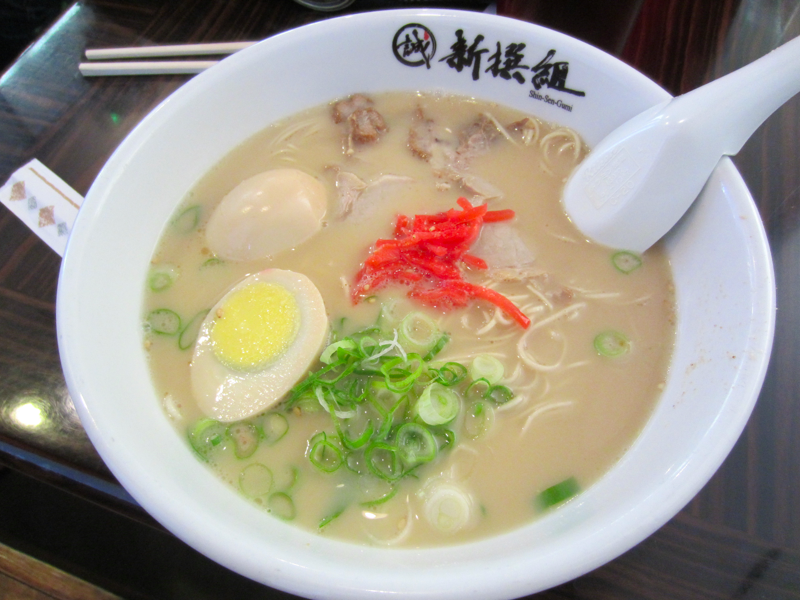 The flavor or the broth could be light, medium, or strong and the noodles could be hard, medium, or soft. I don’t know about you, I love that! You can make the perfect ramen just for you! I am never ever disappointed in the broth. There isn’t much critiquing because it is exactly how I ordered it. Even for a Tuesday, the wait was long and worth it. I just wish it was closer. Hello folks! It’s Joan taking over… the world! Muahaha! 11:54 am – I’m waking up. I get a text from Michelle (from Santa Monica) that she’s riding the train over to my house. I invite Michelle for ramen. 3:15 pm – Tanya arrives. Gives my family haircuts. 3:38 pm – Michelle arrives. We hang around for a bit before we leave. 4:30 pm – I’m about to drive us over to meet with Jennifer, then come to find out, my little brother has my car key! Couldn’t go anywhere with that. So I volunteered Tanya to drive. Sorry Tanya…. 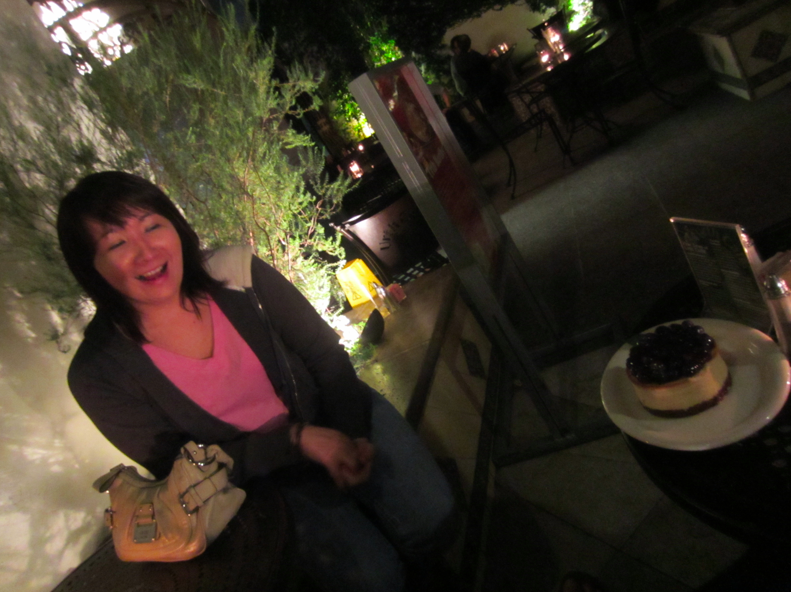 5-ish pm – We arrive at Jennifer’s house and she follows us to Shin Sen Gumi. She drove separately because she had somewhere to be later that night. Little did she know that the ramen house was more than an hour away. Tanya missed 4 phone calls of her trying to figure out where we were taking her! 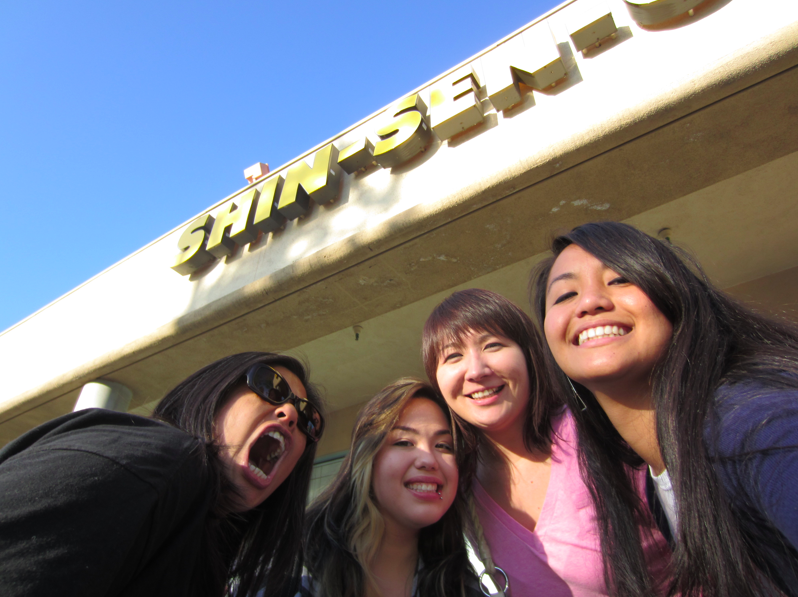 6:15 pm – After driving a distance of 61 miles, we made it to Shin Sen Gumi in Fountain Valley! To our surprise, there was hardly anyone waiting. We thought we’d be able to get in quickly. Or so we thought…. 6:30 pm – Still waiting…. 6:45 pm – Still waiting….. Luckily a server came out to give us our order sheet. I always order the usual here, which is hard noodle, light oil, regular broth, boiled egg, with no bamboo and ginger! 7:00 pm – still waiting…. 7: 10 pm – Okay, I’m totally guessing the timeline here, but I was pretty sure that we waited for more than an hour! We’re finally called in. Tanya almost gets into a cat fight with a pregnant lady who’s group was called first, but it was probably because they were supposed to make their order. Tanya informs the lady that we’ve been waiting for a long time and prego lady didn’t like her answer. We were finally seated and luckily our food did come out right away. 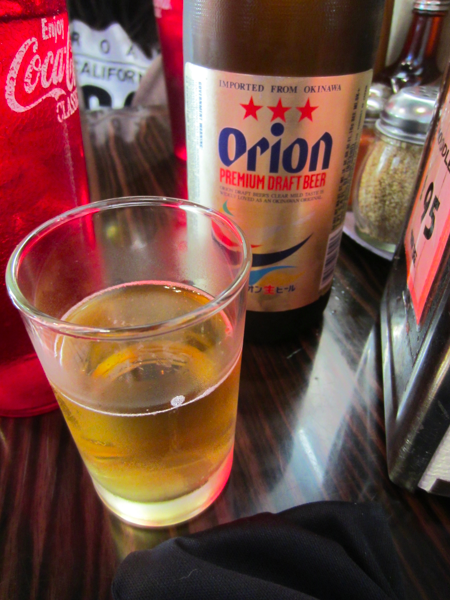 Michelle and I shared a beer I’ve never tried before and it was pretty good! 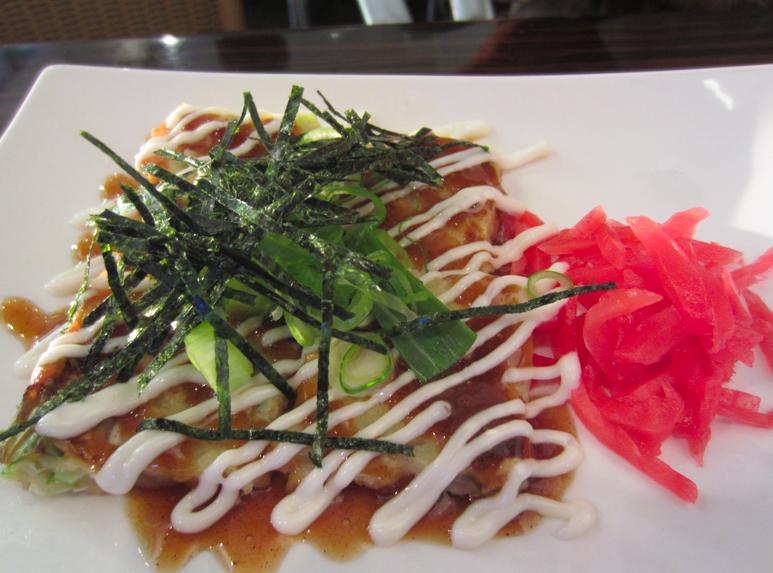 They also ordered some kind of pancake appetizer which was too small to share! But it was delicious! Our ramens arrived and when I took my first sip, it was exactly how it tasted the last time I was there. Perfect. The noodles had the right firmness and taste, the chasu was tender with very little fat attached, and the broth was So Damn Good. 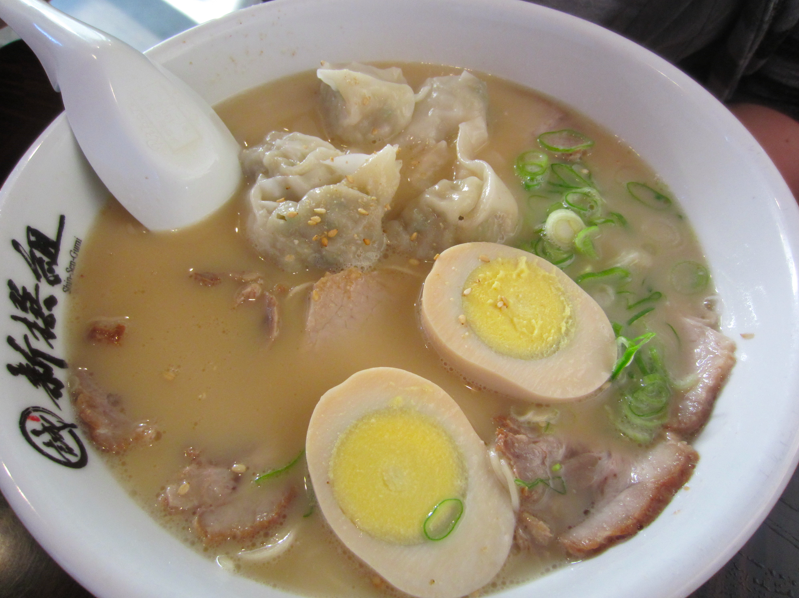 It had the perfect amount of pork broth flavor and it wasn’t too salty. Just great flavor. The thing I love about this place is we can customize our ramen. If I asked for no bamboo and ginger, they do exactly as I say. The flavored egg was nice and warm. My bowl with extra chasu. No bamboo and ginger! Tanya and I had broth left so we ordered a second serving of noodles. This is one of the cool things I like about this place! For an extra dollar, you can get more noodles! 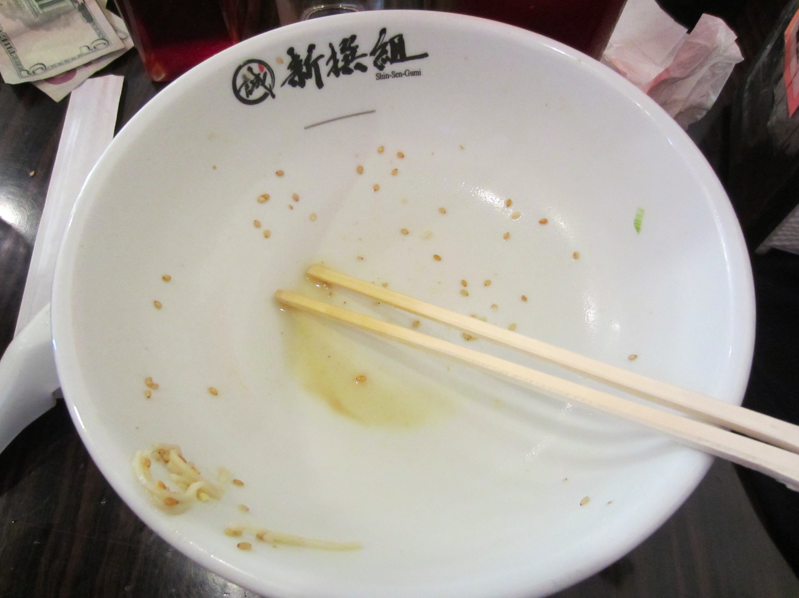 Even after the second serving, I still finished my bowl. That’s how good this place is. 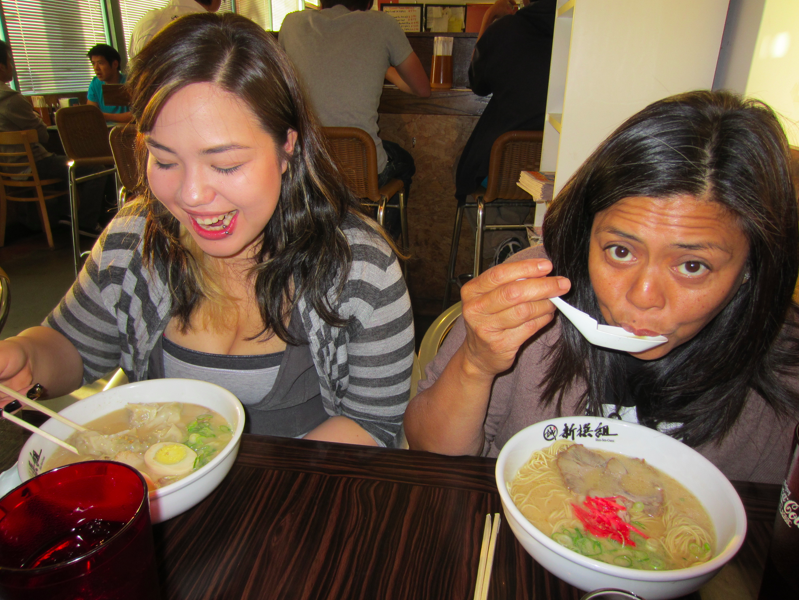 Michelle and Jennifer definitely enjoyed their ramens. Michelle had ramen before but she really thought this place was really good! 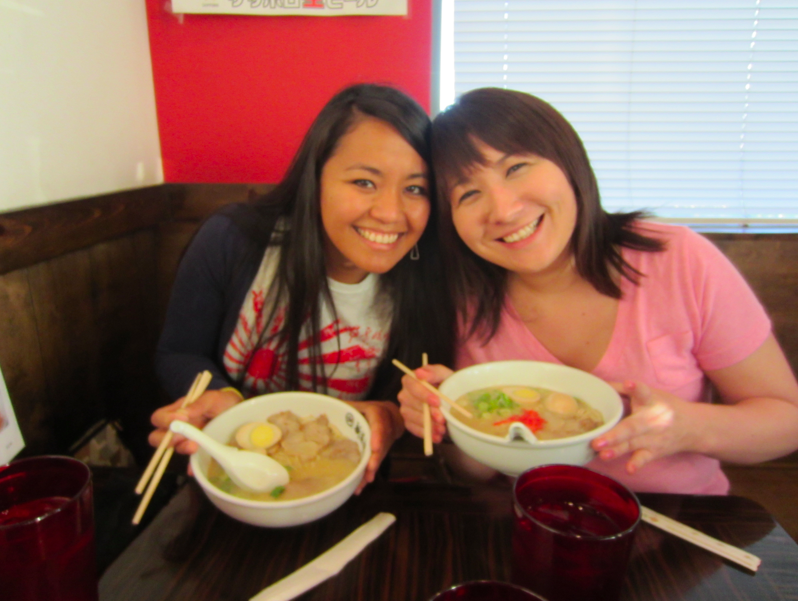 I’m glad they got to have their first ramen experience here at Shin Sen Gumi. Jennifer had to take off after she had her ramen, but we stuck around for dessert. 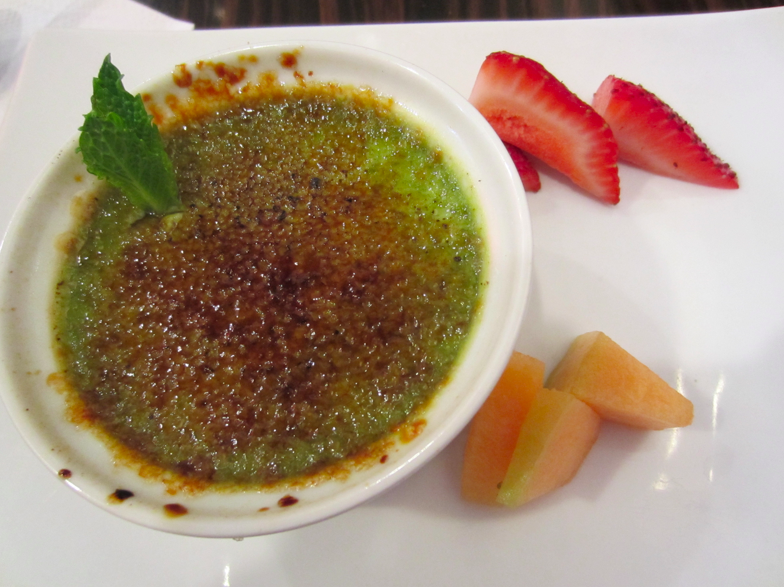 We ordered the green tea creme brulee which was almost perfect. The flavor was amazing. But I’m just picky when it comes to this dessert. It was a little too mushy for creme brulee. We had an interesting moment at Shin Sen Gumi. We looked around at all the employees and they all looked Japanese except the chef. 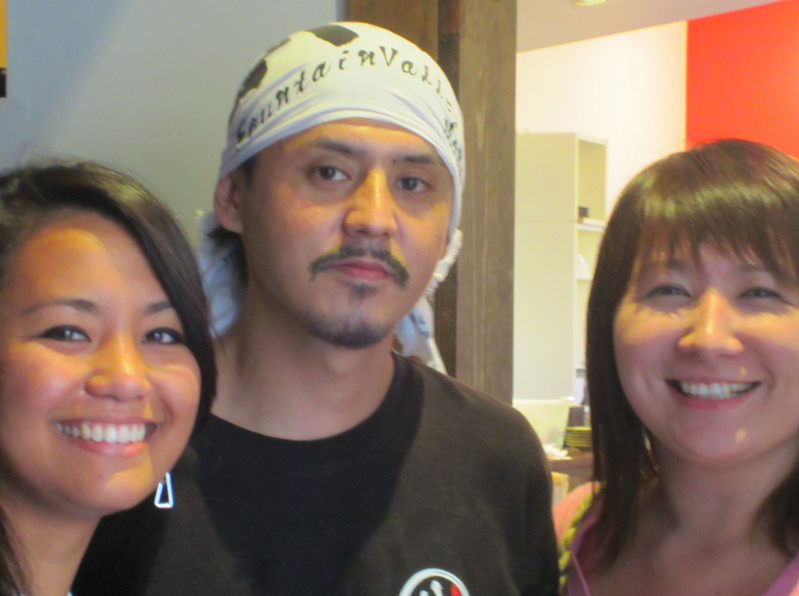 We actually kept sneaking shots of him over the kitchen counter but Michelle got the nerve for us (yes, for us, cuz we wouldn’t have done it ourselves) to just take a picture with him. I don’t think we made up our mind whether we thought he was cute or not. I vote not really. We took a few photos with him because he refused to smile. He still didn’t really smile. Check out the crowd of people waiting to get in! 8: 30 pm – Well, we pretty much made Michelle late for her train. There was no point for us to drive back home so she can take it there, so we had to look for one nearby, in Tustin, about 15 miles from Fountain Valley. When we got there, we almost got hit by a stupid truck driver who swerved over from the far left lane into the far right lane, which we were in. And he wasn’t signalling! We drove up to the parking lot and it was dark and empty. We checked the schedule. Michelle missed the train again. So we had no choice but to drive her back to Santa Monica. That distance between Tustin and Santa Monica was about 50 miles. 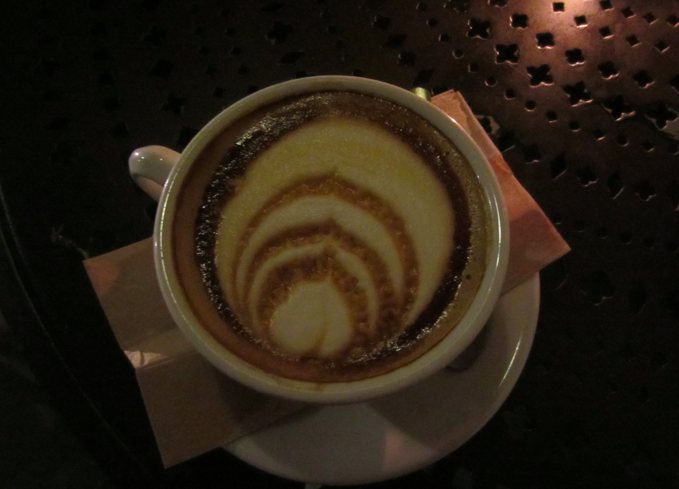 9:30-ish pm – We arrive in Santa Monica and decide to have coffee at a really cool place called Urth Caffe. I’ve been here before and they make awesome drinks. 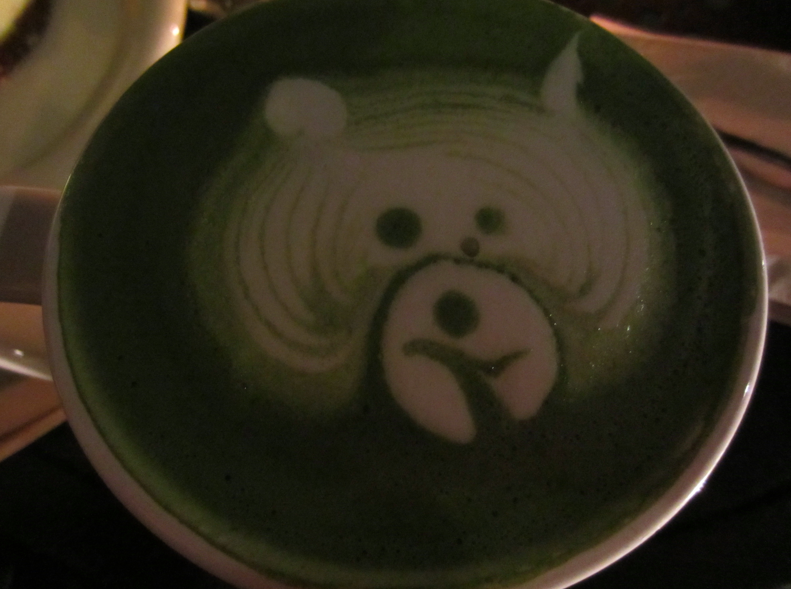 I ordered the match green tea latte, Tanya ordered the honey vanilla latte, and Michelle had a simple latte. All of our drinks were delicious. 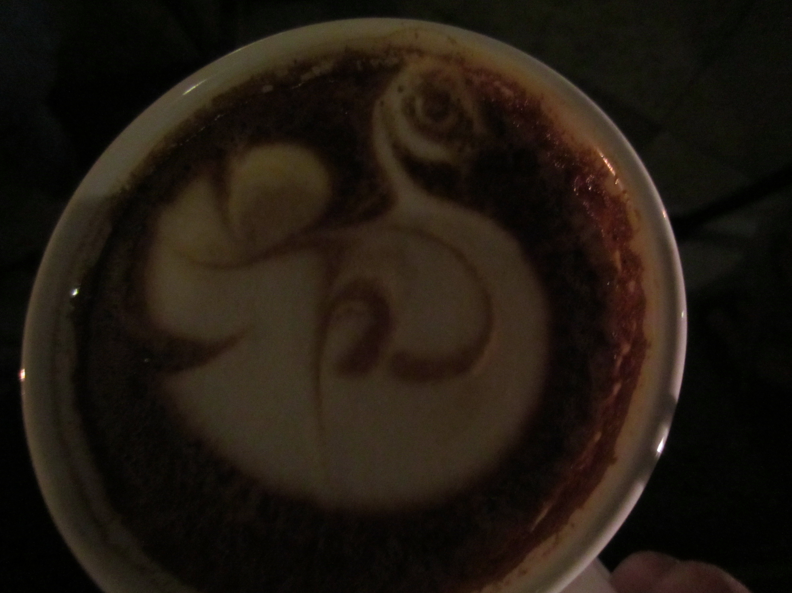 I loved how they draw pictures on the foam! We also shared a cheesecake. Yum. 11:45 pm -By the time I looked at my watch, it was this late. But time flies when you’re having fun and having great conversations. We finally dropped off Michelle at her house and headed back home, which was the longest drive of about 70 miles. 1:15 am – We finally made it back to my house and Tanya headed home herself. I felt bad about Tanya driving so much that night! And she still had to drive home, another 20 miles or so. Okay, so it wasn’t exactly 300 miles, (more like 240-ish or so if we include Tanya’s drive going to my house) but it’s close enough! And we enjoyed every minute of it. 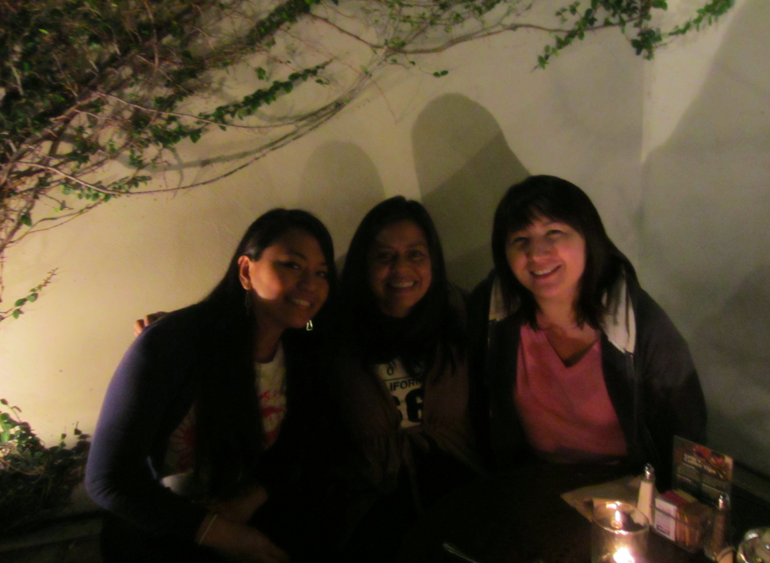 Great food, great conversation, and most of all, great people to be with. 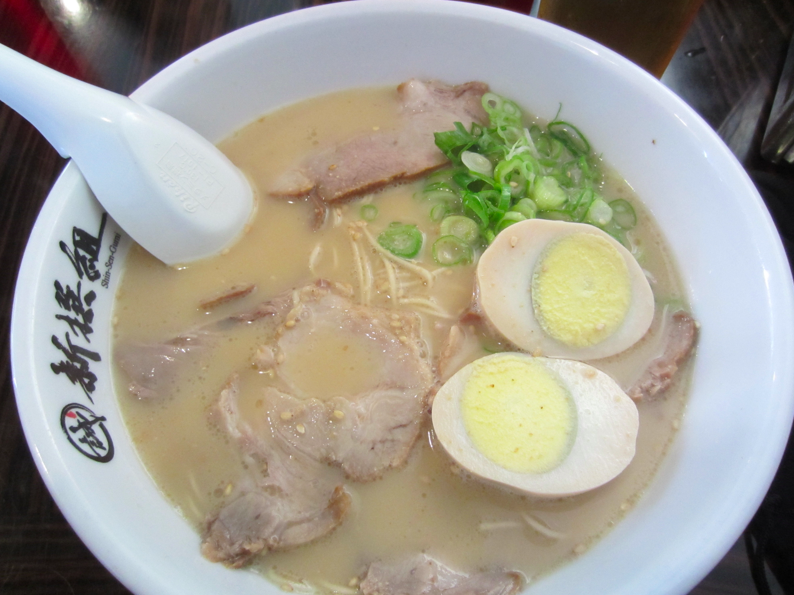 Join us on our next ramen run! Thanks for reading!